MANILA, Philippines - State weather bureau PAGASA on its 11PM update on Thursday, May 7, 2015 announced that seven areas are now under Signal No. 1 as Typhoon Dodong (international name: Noul) has maintained its strength as it continues to move in the general direction of Eastern Luzon. PAGASA raised public storm warning signal PSWS#1(30-60kph) which can be expected in 36 hrs. in the following areas: Catanduanes, Camarines Norte, Camarines Sur, Albay, Sorsogon and Polillo Island for Luzon and Northern Samar in Visayas. Impacts of the wind can be the following: very light or no damage to high risk structures, light damage to medium to low risk structures, slight damage to some houses of very light materials or makeshift structures in exposed communities, some banana plants are tilted, a few downed and leaves are generally damaged, twigs of small trees may be broken, rice crops, however, may suffer significant damage when it is in its flowering stage and the wave height of 1.25-4.0 meters. 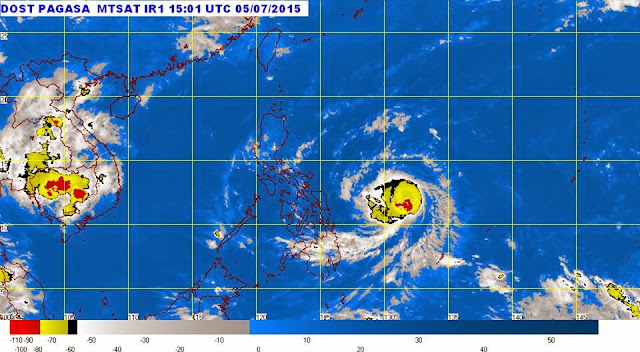 Weather central said that estimated rainfall amount is from heavy to intense within the 300 km diameter of the typhoon. 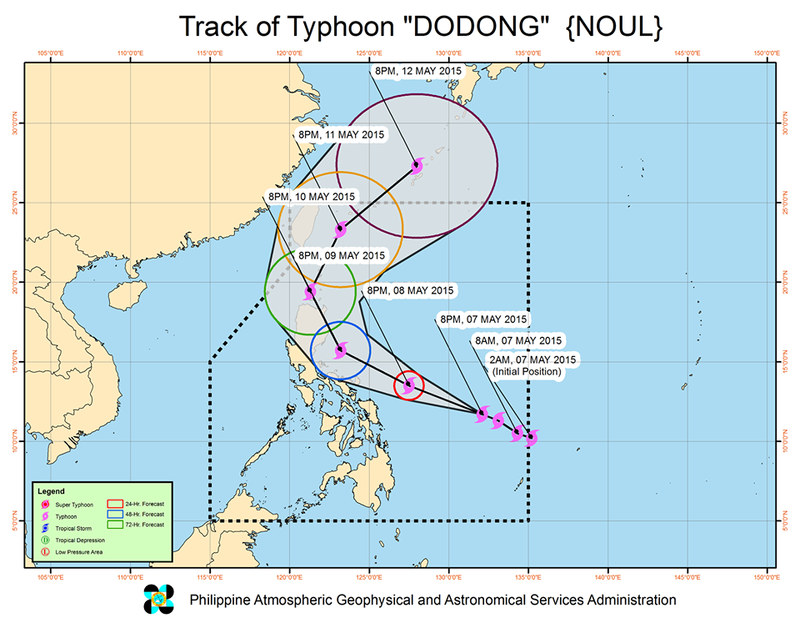 At 10:00 PM today, the center of Typhoon Dodong was located based on all available data at 710 km East of Borongan, Eastern Samar (11.8°N, 131.9°E). It has maximum sustained winds of 150 kph near the center and gustiness of up to 185 kph and it is forecast to move West Northwest at 20 kph. In the issuance of next bulletin (5AM), Public Storm Warning Signal Number 1 will be possibly raised over the provinces of Quezon, Aurora and Isabela.